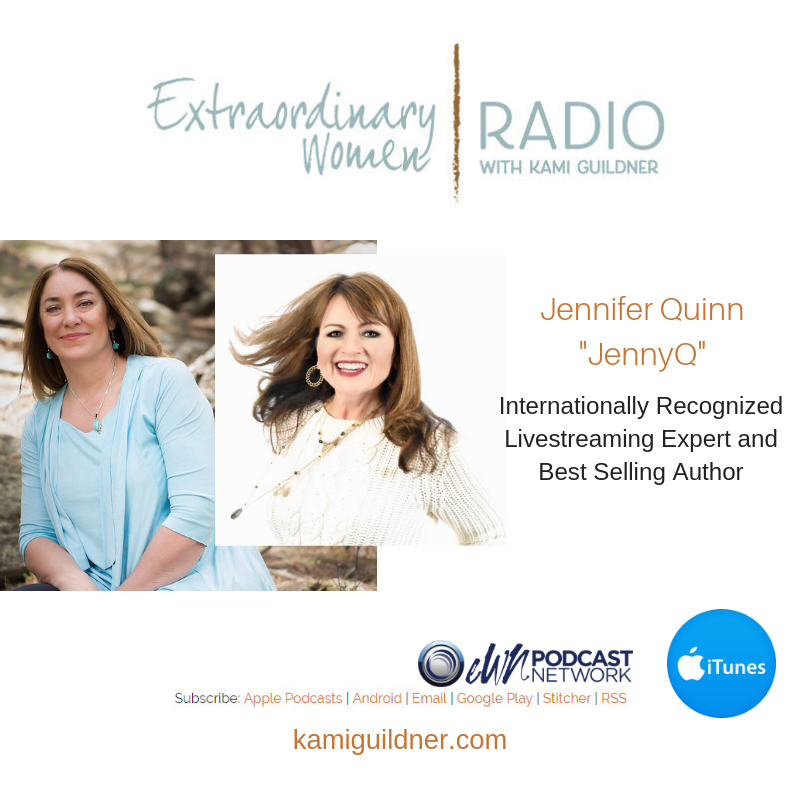 Today’s Extraordinary Women Radio episode is with Jennifer Quinn, better known as JennyQ! JennyQ jumped into becoming an internationally known livestreaming expert with no previous knowledge, whatsoever. Today she’s a livestreaming pioneer, and she’s going to share all she has learned around overcoming the barrier of entry to livestreaming! We have so much fun in our conversation, listening to her journey their Periscope, to Blab to Facebook Live – Jenny shares her best tips creating community online, following our intuitive hits and taking those big bold moves in our business! She’s going to share with us how livestreaming increases our authority, credibility, and top-of-mind awareness. Important stuff when you want to #RaiseUP your visibility in the world! JennyQ teaches professionals around the world to do just that. JennyQ has conducted over 450 live interviews and over the years she has worked all angles of live video from on-air talent to professional production for big brands. Her book, “Leverage Livestreaming to Build Your Brand” debuted as a #1 Amazon Best Seller in Podcasts & Webcasts. To learn more about JennyQ, find her on Facebook, Twitter or LinkedIn or on her website. In this episode, I mention The Botanique Fort Collins – the fabulous urban oasis and spa that I visited last week. Check out their website for more information! And I also mentioned my upcoming Winter Solstice Online Visioning Circle to make 2019 your best business year ever! More information is available here or visit my Facebook page!